What Day Of The Week Was April 11? 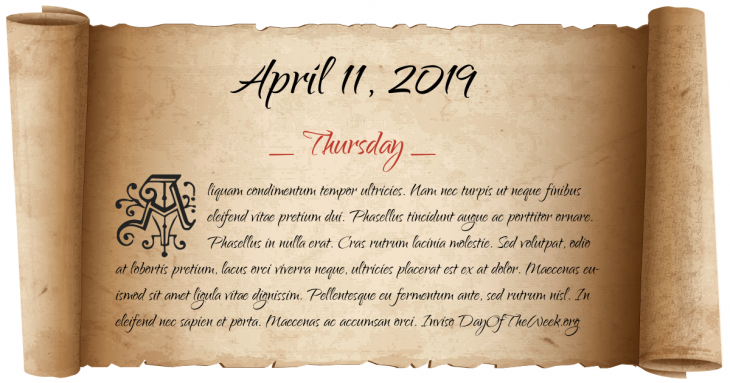 April 11, 2019 was the 101st day of the year 2019 in the Gregorian calendar. There were 264 days remaining until the end of the year. The day of the week was Thursday. War of the League of Cambrai: French forces led by Gaston de Foix win the Battle of Ravenna. The Treaty of Fontainebleau ends the War of the Sixth Coalition against Napoleon Bonaparte, and forces him to abdicate unconditionally for the first time. Former Shogun Tokugawa Yoshinobu surrenders Edo Castle to Imperial forces, marking the end of the Tokugawa shogunate. The Stone of Scone, the stone upon which Scottish monarchs were traditionally crowned, is found on the site of the altar of Arbroath Abbey. It had been taken by Scottish nationalist students from its place in Westminster Abbey. The detained crew of a United States EP-3E aircraft that landed in Hainan, China after a collision with a J-8 fighter is released. Who were born on April 11?